The Traditional Latin Mass is the Catholic Mass as it was offered for centuries, up to 1970. This Mass, canonized by the Council of Trent (adjective: Tridentine), was the form used in the Roman Rite for many centuries, from the 5th century through 1970. 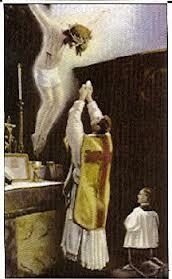 Very few changes took place in the Tridentine Mass during that time, and any small changes were not drastic. Many of these incremental, organic changes to the Latin Mass were the result of the Church reacting to various heresies that developed over the centuries. In 1970, in the aftermath of the Second Vatican Council, countless changes were effected in the Catholic Church, including drastic wholesale changes to the Liturgy. Priests and religious gave up their vocations and became laymen; meanwhile new priestly and religious vocations were drastically reduced. Many seminaries and pre-seminaries had to be closed. The effects of Vatican 2 were just as striking in the lay sphere. Catholics were encouraged to open up to the modern world and other religions, and many of them got the message. Many Catholics stopped attending Mass every Sunday. This caused many parishes to be closed or merged. Many Catholics today no longer understand what the Mass actually is. But the blame for this must be placed at the feet of the Novus Ordo Missae itself: it distorts and re-orders the purposes of the Mass. The sacrificial aspect, for example, is notably absent from the prayers of the Canon in the Novus Ordo Mass. Meanwhile the community aspect is exaggerated beyond all proportion. With 45 years of history under our belt, with all the evidence of destruction that those 45 years have brought, I think it’s safe to say that Vatican II was an unmitigated disaster that needs to be renounced and rolled back as soon as possible.